Many years ago, a lot more than 50, but fewer than 70, when I was a young child, my father deviated from the regular schedule of the church service. Here's what I remember of that Sunday morning. My father had purchased a Bible which he wanted to place on the Communion Table (that's the table on which you can see an open book). He said that the Bible should remain on the table, open, and from time to time he would change the page to another chapter, and perhaps another book, and would talk about that for a few minutes. On this particular Sunday he had selected a chapter in Psalms. I do not remember what the chapter was, nor do I remember the sermon that day. I do remember another thing that my father pointed to, however. In this picture you can see a small sign over the Pastor's Chair which is just behind the Pulpit. It is black and is just above the burgundy colored curtain. It says, "Jesus". This, my father told the congregation is Who was precious to him, and he wanted it there to remind the church on Whom it was built. As Jesus Christ was humble, my father wanted the sign to be small and unobtrusive, but visible even from the back row of the church. 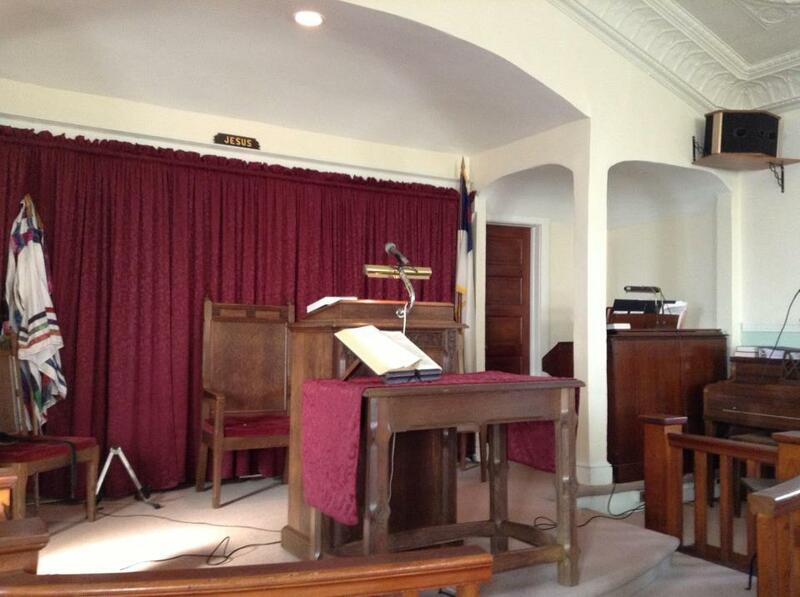 Dad then stood behind the pulpit, prayed his closing prayer, and we all sang the Doxology as we left the building. I really never forgot that day when dad opened that Bible, placed it on that table, and said as long as he was pastor, he wanted that Bible there. It was on that table for over 50 years.